Introduction The study investigated access to primary health care by examining various access parameters such as availability, accessibility, and affordability in the rural Tasmanian area of Meander Valley. Qualitative data was collected from the semi-structured interviews with 30 people within Meander Valley recruited through convenience sampling. Method Thematic analysis was used. Themes were identified through two complementary sources: literature review and the semi-structured interviews. Themes were then collapsed into categories and the data was reread to determine the depth of evidence available for each of the categories. To validate the conclusions, interviewees were presented with the major categories and asked for a response to the major ideas. Additional literature was reviewed to provide perspectives on emerging understandings. Result The project participants expressed relative satisfaction with local health care service provision in general, although most cited a mix of satisfaction with some services and dissatisfaction with others. This satisfaction was understandable with the outspoken recognition that it was unreasonable to have high expectations about health service provision in rural and regional areas. Regarding health care access parameters, the main issues of concern included the absence of specialized, dental and after-hours care, high services costs, and transport difficulties. The resourcefulness of people with chronic health issues and their cares emerged as important, as was the relationship between lifestyle choices, alternative and mainstream health care options. 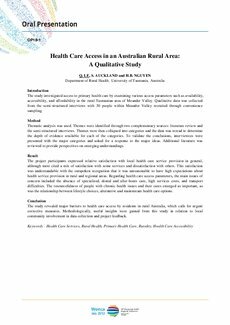 Conclusion The study revealed major barriers to health care access by residents in rural Australia, which calls for urgent corrective measures. Methodologically, useful insights were gained from this study in relation to local community involvement in data collection and project feedback.